Sale.a.bration 'Epic celebration' card Stampin up! Hello and welcome back to Chapter Crafts. 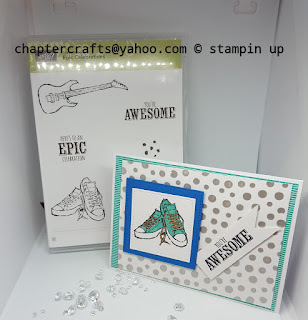 Today I have made a very simple card using the free Epic celebration stamp set from the sale.a.bration catalogue from stampin up! This is one of those sets where you can use it for any occasion. First you need whisper white card stock cut to 8 2\8" x 5 13\16" and score @ 4 1\8"
Whole lot of lovely designer series paper cut at 4" x 5 3\4"
Whisper white card cut at 5 1\4" x 3 7\8"
Using the silver embossing paste and the bubbles mask creat the back ground to give it a bit of a shine. Using the 'stitched frame lets' cut out 1 square in Whisper White and one bigger in Pacific point card. Coloured ink used is basic black ink. Colour in you image. Labels: Epic celebration and embossing paste card Stamping up!